I woke up this morning having just dreamed about finding a lost dog. A couple hours later, I was putting some stuff in the van, getting ready to go to homeschool co-op with my 5 year daughter when I saw this dog running loose in my neighbor's yard. I've rescued this dog once before - it lives on the next street (although I don't know what house). So, I try to get it to come to me to no avail. It eventually decides to chase after a rabbit and takes off in the other direction. All of us will go through times when our faith is severely tested. We'll experience times of excruciating darkness and even agony, and we'll wonder, "Where is God?" We'll not understand his ways. We'll feel as if all is lost, that God no longer loves us, that he has abandoned us. And then we'll remember - I hope we'll remember - Mary's example of faith at the foot of the Cross. We'll recall that she, too, did not fully understand. She, too, stood in darkness. She, too, had a heart that was bleeding and broken. We'll also remember that she didn't give in to the darkness, that she clung to God with the light of faith. May we follow Mary's example on Good Friday and cling to God when it seems that He has abandoned us and all is lost. Easter is waiting on the horizon, even when we can't see it. One of the hardest things for a parent of a child with special needs is getting that child's (and his or her own) religious needs met. Kathy Labosh, the parent of two children on the autism spectrum, knows first hand how difficult that battle can be, and she set out to do something about it. She approached the Director of Religious Education at her home parish about the need for a special education classroom. The DRE responded, "Great. I'll find you a room; just tell me what you need." Labosh hadn't expected that, but did her best to meet the need. She shares what she learned and offers a blueprint to other special needs religious education teachers in "The Child with Autism Learns about Faith." Labosh suggests having the parents of the children with autism attend the class along with their children. This allows them to serve as aids, working one-on-one with their individual child, but also provides an opportunity for the parents to have their own faith enriched and to connect with other parents walking in their shoes. Each lesson plan includes prayer, group activities, scripture reading, packet work (individual work), video/songs (during which time the parents have a short reflection time together), and a closing prayer. The time for parents to connect is especially worthwhile. Labosh has included reflection questions especially geared to those parenting children with autism. 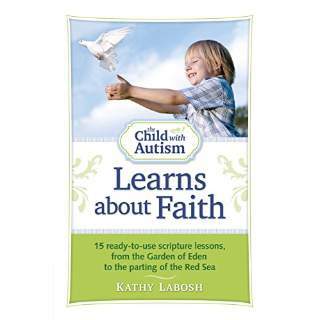 "The Child with Autism Learns about Faith" is a valuable resource. It only covers Genesis and Exodus, but creative religious education teachers could certainly use the same framework to cover other topics with a little adaptation. It also is helpful to have at least a few students in the class. It might be worthwhile to have two or three parishes work together to create a class if one by itself does not have enough students to support a separate special needs class. Laura Ingalls Wilder is well-known as the beloved young heroine “Laura” of the Little House books that she wrote. “The Selected Letters of Laura Ingalls Wilder,” compiled and edited by William Anderson, helps complete the portrait of the woman behind the stories. Here we have the adult Laura in her own words as she writes to her daughter Rose, to friends, to editors, and to fans. Letters included span from 1894 (prior to her writing the Little House books) until her death in 1952. Over 400 letters are included in this collection. Amazing as it seems, this is only a fraction of her total correspondence. As Anderson states, “Many of her letters are lost to history.” While the letters that survive create quite a picture of the life of the adult Laura, there are huge blanks in the history. For example, there is no record of Laura ever taking care of her mother or her blind sister Mary, no comment on her grief as her parents and sisters died nor when her own son and grandson died in infancy. Laura’s daughter, Rose Wilder Lane, destroyed many of Laura’s letters herself – especially those Laura had written her in the 1940s and 1950s. These letters will certainly be of interest to any adult who has loved and read the Little House books over and over. Laura’s letters to Rose as they worked on the Little House books together are especially significant. This collection also presents a picture of life in the first half of the twentieth century and is valuable for its social history. Anderson’s comments help provide a framework for the circumstances surrounding the individual letters. “The Selected Letters of Laura Ingalls Wilder” is a worthy addition to the materials currently available for studying the life of this famous author. In When You Suffer: Biblical Keys for Hope and Understanding, Jeff Cavins tackles the difficult question of why a good God allows us to suffer and what we can do to make that suffering have value in our lives. He defines suffering as anything that makes our life less than ideal, so this can include life’s minor inconveniences as well as the heavy-duty suffering that can come with physical, mental, or emotional pain. Cavins separates suffering into two categories: physical and moral. Physical is temporal, of this earth. It is temporary. Moral, on the other hand, can have eternal consequences and lead to the loss of eternal life. He also states that there are different purposes for suffering. Punitive is suffering as the result of sin. In a statement that many people today would be uncomfortable with, he maintains that God does punish us, but He does it for our good. However, not all suffering is punishment for sin. Some suffering is probative, or a testing of our faith. Other suffering is disciplinary, in which God is trying to educate us, once again for our benefit. Is there meaning in our suffering? Cavins’ unequivocal answer is yes, provided that our “suffering is joined with the suffering of Christ.” Anyone raised Catholic has probably been told to “offer it up” when complaining about one thing or another. Here is where that comes in. We are called to share in Christ’s suffering. St. John Paul II maintained that “nothing was lacking in Christ’s suffering, but so that we might know the love of God more deeply, Christ has made room in the suffering for us to participate in it.” But this doesn’t happen by default. We have to will our sufferings to be united with His. Cavins also discusses some practical ideas for how to cope when you are suffering. He states that “suffering gives you the opportunity to grow . . . [into] a holier person, a more patient person, a person who endures, a person who is kinder, a person who is more merciful. All of this is the fruit of suffering in your life.” That doesn’t necessarily make it easier to accept. For that reason, Cavins offers a list of “Ten Things to Do When You Suffer,” which includes such items as entrusting yourself to God, going to Confession, praying the Rosary, and keeping an eternal perspective. Cavins has tackled the subject of suffering well. The question of why we suffer has always plagued humanity and will no doubt continue to do so. When one is in pain, no glib answers will suffice. One subject Cavins doesn’t touch on is why young babies and children have to suffer, which is even more difficult to accept than adult suffering. Still, for someone who wants to learn more about a theology of suffering or who is struggling to find meaning and value in a pain-filled existence, When You Suffer may offer the answers that they need.